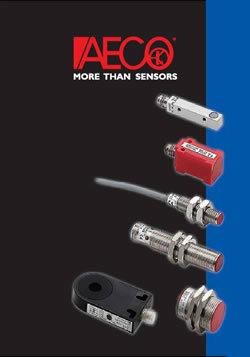 More than sensors: Since 1978, when AECO was founded in Inzago (MI), we follow step by step the growth of our customers. A gradual process but in continuous evolution which has resulted in a significant growth to achieve our goals and satisfy our customers requirements. Manufacturers of Quality Industrial Automation controls and Sensors. Metallic material sensible. Available in cylindrical thread from M5 to M30, parallelepiped and ring versions. Switching distance from 1 to 50mm. Alternate or direct current models. ATEX CAT. 3D series alternate or direct current versions. NAMUR direct current versions certified to ATEX CAT. 1G/D-2G/D-3G/D. All models available with cable or connector plug. Sensible to all materials. Comes in cylindrical housing diameters 18,30,40mm versions. Adjustable switching distance. Alternate or direct current models static or with relay outputs. Models with instant intervention or timed up to 15 min. ATEX CAT. 3D series alternate or direct current versions. All models available with cable or connector plug. Sensible to all material within own sensing range. M18 cylindrical housing in metal or plastic series. Rectangular plastic housing 18x50x50mm series. 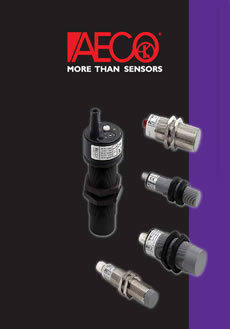 Fibre optic and sensor with various shaped terminal series. Built-in sensibility adjustment. Alternate or direct current models static or with relay outputs. All models available with cable or connector plug. Sensors that have a built-in REED switch that activates when a magnet is near. Supplied in standard version with open, changeover and bistable contacts. The metallic housing of cylindrical series SMC comes in 6-8-10-12-18mm diameters. Plastic or metallic housing of parallelepiped series SMP in dimensions 15x8x32mm. Magnets available in various shapes and dimensions. Ultrasonic sensors for detection of objects in well defined areas, or for distance measurement such as in the case of tank levels. Available in measuring distances from 20 cm to 5 metres, from M12 to larger parallelepiped 6x4x4 cm compact housings. Programmable by means of potentiometer or self-programmable M12 version. All models are available with analogue or digital (binary) outputs both in current as well as voltage and all models are supplied with M8x1 outlet connectors. Fork shape version with 40 mm belt-guided opening and detection range of 13 mm with a 0.1 mm precision tolerance and analogue output from 0 to 10V. The Beamstar safety light curtain series FBS or FBSEL have a projector and a receiver, integrated by an external power supply unit FBS-AL provided with a safety relay FBS-UR conforming to norms. The system controls the safety of operator during various phases: finger, hand, body and thanks to its compact dimensions and easy installation represents a downright “safety door”. The safety light curtain maintains a constant functionality regardless of the operating distance, the correct functionality is independent of dust deposits and the state of the curtain is indicated on a numeric display in real-time on FBS series, or by LEDs for FBSEL models. Available in 14, 30 and 50mm resolution models (other resolutions available upon request) for small object detection or in 1-2-3-4 ray models for body detection in protection levels 2 or 4 according to EN61496-2. They function in the vicinity of the material to be controlled. This unit is used for checking for the slowing down of rotating units due to the slipping of belts of clutches, fracture of transport belts or chains or as a motor protection in the case of mechanical overload. This control is carried out by the CRTP controller which is made up of an electronic circuit which is enclosed in a plastic container which has an undecal plug and a sensor which can be inductive, capacitive or photoelectric. DIN mounting equipment that offers the easiest and most efficient way to implement fail safe security in hazardous application areas. It offers the possibility to house 176 channels in only a one meter long DIN rail. high velocity signal repettion accuracy. LED power, signal status and line failure indicator. ATEX GAS-DUST fail safe according to 94/9/EC norm. photoelectric sensors in D.C. current when a more powerful relay output signal is requested or timing function is needed. Plug and Cable assemblies: M8, M12, Straight and 90°, Feild wirable plugs and sockets.